Make and bake cake mix as directed on box for 13x9-inch pan, using water, oil and eggs. Cool. Line cookie sheet with waxed paper. Crumble cake into large bowl. Add frosting; mix well. Roll into 1-inch balls; shape each ball into triangle, pressing sides flat to look like candy corn. Place on cookie sheet. Freeze until firm; keep refrigerated. In microwavable bowl, microwave yellow candy melts and 2 tablespoons of the shortening uncovered on Medium (50%) 1 minute, then in 15-second intervals, until melted; stir until smooth. 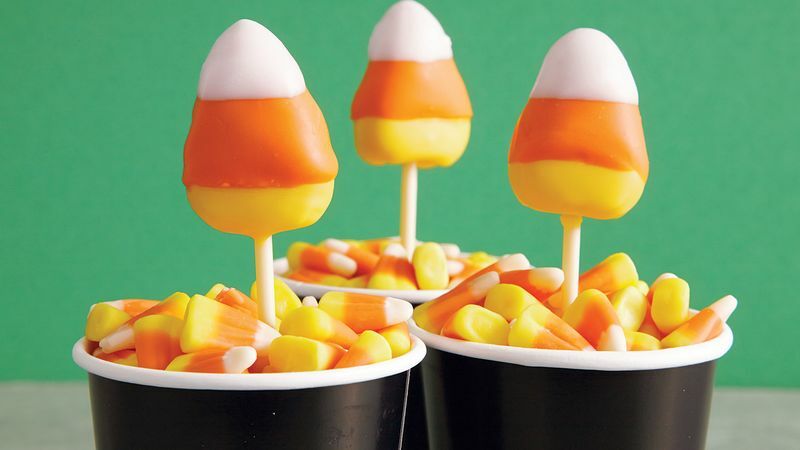 Repeat with orange candy melts and white candy melts, using 1 tablespoon shortening for each. Dip tip of 1 lollipop stick about 1/2 inch into melted yellow candy and insert stick into base of 1 cake triangle no more than halfway. Repeat. Return to cookie sheet. Refrigerate 5 minutes. Remove from refrigerator a few at a time. Dip cake triangles in melted yellow candy; tap off excess. Poke opposite end of stick into foam block. Let stand until set. Dip two-thirds of each cake triangle into melted orange candy; let stand until set. Dip tips in melted white candy; let stand until set.